If you’re a parent of twins or 2 closely aged children, then you probably know how hard it is to go about daily chores. You can easily do household activities and still keep an eye on the little ones, but some stuff requires leaving your home, and that’s when the fun begins, doesn’t it? As you probably came to the conclusion yourself, the most efficient solution for your problem is buying a double stroller. Double strollers are a very smart way of taking both of your kids with you in a safe and convenient manner. But with the big number of options available on the market, finding the best one is something that takes some time and dedication. There are so many parents who made rushed decisions just to discover that the strollers they got were not quite to the standards they were advertised at. We know how stressful life can get, especially when you have young kids, so we decided to step in and offer our help. We made some research on the best double strollers that we could find and talked to parents of twins to get some genuine opinions on our finds. 1.1 How often will you be using your stroller? 1.2 For how long do you plan on using the double stroller? Whenever looking to buy something, it doesn’t matter what, you should document yourself well on the subject. Never ever make hasty decisions, especially when you’re looking for a product or service that has a daily impact on your life. By gaining knowledge about something before taking the decision to purchase, you make sure that you will not regret that decision in the future. How often will you be using your stroller? This is one of the most important questions that you should ask yourself. It’s also the first question because answering it will enable you to determine the budget you will dedicate and the type of stroller you’re going for. Will I only use the stroller a few times a month? Will I use it for quick chores that only take a few minutes? Will I use it for long walks in the park? These are just some of the questions that will help you get to a pretty precise answer how often you’ll be using the stroller. After having figured out some answers to how often, you’ll be able to determine an appropriate budget. For how long do you plan on using the double stroller? If you plan on using it only for the first year of your babies’ lives, then you would want to consider a double pram if you don’t need it to be too versatile. If on the other hand, you plan on using it until your children can walk by themselves, then going for a higher quality model will be completely worthwhile. A superior model provides a longer lifespan and increased comfort and usability for both your kids and yourself. You’ll see that it will be much much easier to think about particular features needed after having a rough estimate of how long and frequently you’re going to use the stroller. The one thing that each purchase converges to is price. It’s a very important factor because you don’t want to overspend. The best case scenarios is you buy something that offers high value for its cost. The price range for strollers is pretty wide. You can find them starting at under $100 and reaching to over $1000. Usually it’s a good guideline to think of the price you pay as a good estimator for that models value relative to competing products. But it’s not always the case. 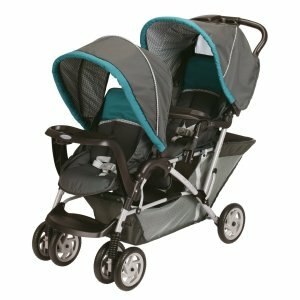 Sometime higher end double strollers are only in that price range because they are built with different materials that don’t necessarily make a difference in durability or functionality. So, don’t fall into the trap that more expensive means necessarily better. The biggest number of models are priced around $200 to $400-500. This is a price range where you can find many high quality items that offer high value for the actual cost. It’s important to treat the purchase of a double stroller as an investment. Your end decision should be heavily based on the overall value of the model and the value in relationship to your needs. You shouldn’t forget that this is only one part of the equation when you have twins. You will have have to balance the cost of the stroller to the cost of everything else you need. This mindset is going to help you a lot in taking the financially-wisest decision. Double Side-by-Side Strollers. This is probably the most popular type of double stroller. It offers the ability for your little ones to sit, as the name implies, side-by-side, as opposed to tandem strollers where the seats are organized one behind the other. The only disadvantage with this design is the entire width which might seem somewhat inconvenient to go through narrow places. But, we have to say that manufacturers who have identified this weakness made some redesigns of their new models that are as compact as functionality lets them be. 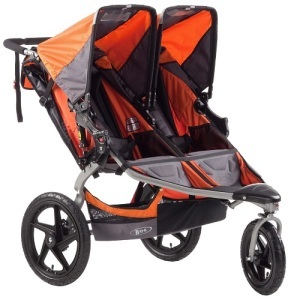 Double Jogging Strollers. This type is perfectly suited for parents that have an active lifestyle and want to get faster around. You don’t have to necessarily be an Olympic runner to take advantage of this design. It has 3 wheels, with one wheel in the front. The front wheel is pretty good at going over uneven terrain. It has, though, some maneuverability difficulties. All-Terrain Double Strollers. The best thing to do when trying to understand this type is to think about all-terrain cars. These are literally the monster trucks of double strollers. Built to pass through harshest of conditions, these models bring that added robustness and durability. The front wheel of these models lock, so you’re able to easier maneuver them. Tandem Double Strollers. These are the counterparts of side-by-side models, and are designed to be more narrow, having the seats positioned in single file. The main advantage of this design is that it’s narrower, but there are some disadvantages, that in our opinion put the main advantage in the shade. The child sitting in the back will experience less comfort with the reduced space available, and once they reach a certain age, they’re going to battle over who is going to sit in the front. Tandem models can also be found in jogging and all-terrain designs, but we strongly recommend considering side-by-side models. Sit & Stand Double Strollers. These are perfectly suited for parents who have a later second addition to the family. They give younger to child the comfort of laying vertically in the front while the older one in the back has the ability to stand up. This type gives the older child movement freedom, making everyone happy and content. Lightweight Double Strollers. 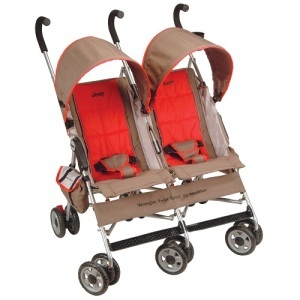 As the name implies these strollers are very light and fold up like an umbrella. They’re perfectly suited for storage in small spaces. They are very practical, and thanks to the curved handle that is often found on these models mild on mom’s or dad’s wrist. One commonly encountered weakness with this type of strollers is the fact that not all models can be put into a flat position, so they might not be the best choice for newborn babies. You should be knowing a thing or two about these products by the time you reach this section. It’s hard to know everything there is to know, so don’t blame yourself if you don’t have a completely clear picture of which type is best suited for your needs. Further you’ll discover some of the best choices. If you don’t know exactly by now, after checking out our top picks, you’ll be able to see exactly which type will make you and your little ones the happiest. In this section of our guide, we’re taking a closer look at those that we thought to be the top picks in their respective categories. A swiveling front wheel that offers high maneuverability and increased stability because it can lock in a straight position. This feature is great for jogging or handling rough terrain. A light frame that folds in 2 steps and makes storage and transportation a breeze. An adjustable suspension system that makes for a very comfortable ride. The smartly designed accessory adapter helps you easily connect the Infant Car Seat and Snack Tray from BOB. Padded, adjustable and reclining seat with a 5 point padded harness designed to keep your children safe and comfortable. A width that allows it to fit through standard doors. The shade is great and is made out of impermeable material. A con may represent the fact that some parents may find it heavier than normal. This is an aspect that depends though on what heavy means for each parent. The item weighs 34 pounds, so it depends on what that means to you. An exceptional level of versatility. The stadium style seating holds two Graco Classic Connect car seats. Can withhold both your kids up until either of them reaches 40 lbs. The 2 comfortable reclining seats have individual canopies and footrest. It folds easily with only one hand needed, so you have the other hand free, which is a big advantage as every parent of young children probably know. Under the seats, you can store anything you need to take on your stroll. It’s hard to find another tandem model on the market right now that can compete with the Graco DuoGlider at this price range. The only weakness that this tandem stroller seems to have is the lack of a big number of settings when it comes to adjusting the seats. If you want to learn more and check out other top rated models, read our guide on the best double strollers. It’s made out of metal, for added durability. The multiposition mechanism allows you to adjust the glider to the desired position with ease. The reclining mechanism makes the back rest fully adjustable. The hardwood frame has an espresso finish. You can clean it easily because the fabric used is a sage green microfiber. The foam cushions and padded arms are removable. The rapid deterioration of the sun shades after folding the stroller multiple times. The lack of enough storage space. Difficulty taking corners with both kids on. After seeing our guidelines on selecting a double stroller and checking out our top picks in different categories, you have all the information you need to make a great decision, that will not only serve your children’s needs best, but will offer high value for your money. Most times, you can find the best deals online, especially on sites like Amazon. Purchasing from Amazon is safe, cost efficient and fast, as they ship in 1-2 days, depending on where you live. Anyway, if you by any chance have the possibility, check out the strollers you read about here in your local store before taking advantage of the best prices online. 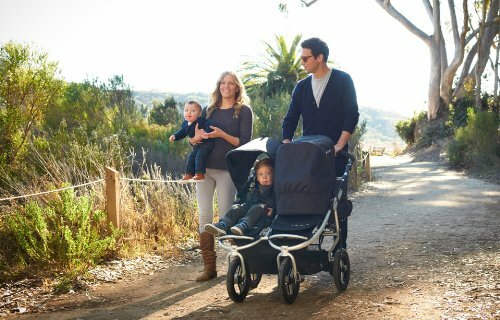 We hope this guide has helped you develop a better informed opinion and that the results of our research will help you easier decide on the best double stroller for you.